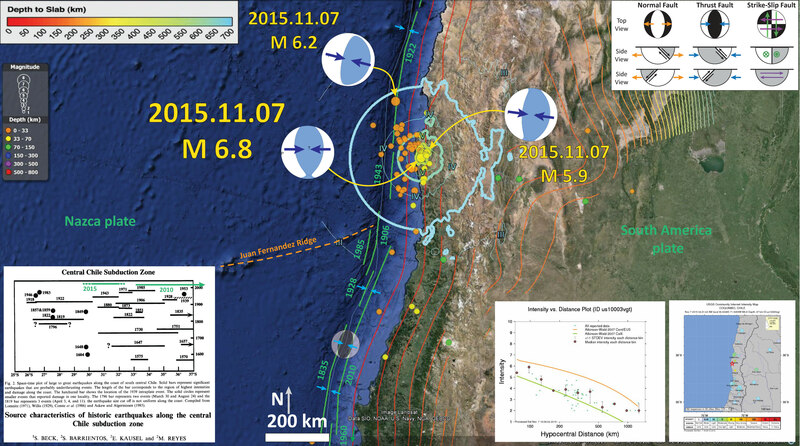 This past evening there were several earthquakes in the region of the 2015 Cocquimbo earthquake region. The largest earthquake has a USGS magnitude M = 6.8. 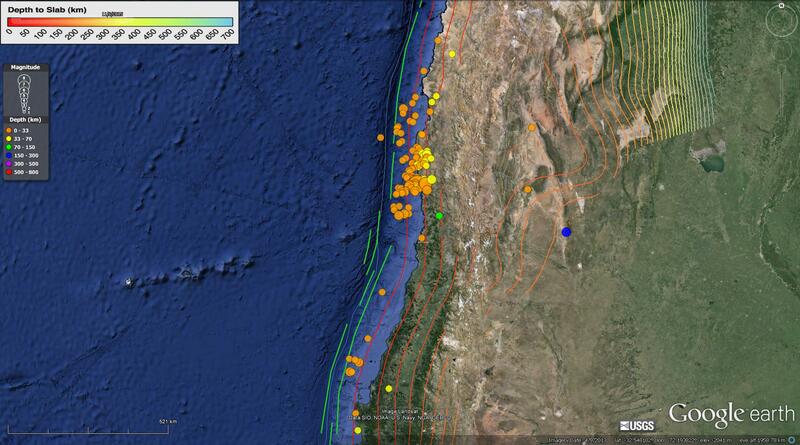 Below is a map that shows these seismicity from the last 2.5 months. I plot the USGS moment tensors from the three earthquakes listed above. I also place the modeled shaking intensity contours. These contours are based upon the Modified Mercalli Intensity (MMI) scale. I also include the slab depth contours (these represent the depth to the subduction zone fault; Hayes et al., 2012). These slab contours are based on seismicity and include considerable uncertainty. However, today’s M 6.8 earthquake has a USGS depth of 37.6 km and the Hayes et al. (2012) 40 km slab depth contour is very close to the USGS epicenter. In the lower right corner, I also place the map that shows the results from the “Did You Feel It?” (DYFI) USGS web form. These results are from real observations. One may compare these DYFI results with the modeled estimate of ground shaking with the “Intensity vs. Distance Plot” (to the left of the DYFI map). This can be called an attenuation with distance plot, as the ground motions diminish with distance. This attenuation is controlled by several parameters, including the Earth materials that the seismic waves are traveling through. The blue-green dots are from the DYFI data. The green and orange lines represent the model results using empirical relations between ground motions recorded during thousands of earthquakes in California and Central/Eastern US respectively. The observational data show a moderately better fit to the California curve. Perhaps the Earth materials in this part of Chile are slightly more like the earth materials in California and less like the materials in Central/Eastern US. Here is a map that shows these DYFI results along with the MMI contours. Note how they are similar to each other (but imperfect). This represents how the modeled ground motions are not a perfect representation of reality. I also present Figure 2 from Beck et al. (1998 ) on the map, the space-time plot of historic and prehistoric earthquakes associated with the Chile subduction zone. I add a green line showing my interpretation for the strike length of this M 8.3 earthquake. Originally it appeared to match the 1943 and 1880 earthquakes, though it appears to extend further along strike. The 1922 and 1880 strike lengths are not well constrained, so this 2015 earthquake may indeed be slipping the same patch of this part of the subduction zone. Indeed, Juan Fernandez Ridge may be a structural boundary that may cause segmentation in this part of the subduction zone. If it does, it does not do so every time, as evidenced by the strike-length of the 1730 AD and 1647 AD earthquakes. In September of 2015, there was a series of large earthquakes in this region. The largest magnitude was M = 8.3. I interpret today’s earthquakes to be aftershocks from the September swarm. 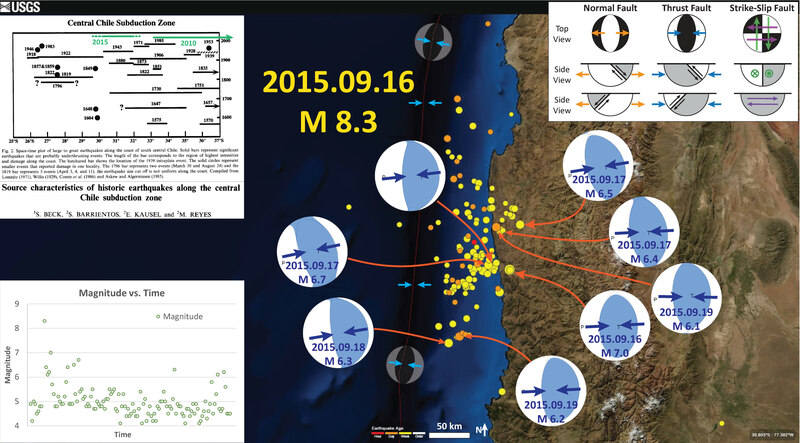 Here are some earthquake reports from September 2015. 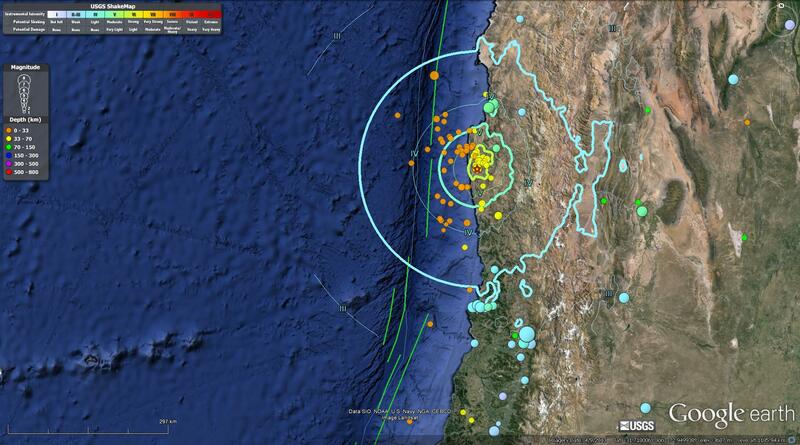 Here are some reports that include comparisons of historic seismicity of this region. Here is a map that puts this September-November seismicity in historical and prehistorical context. I prepared this in September, so it does not include November seismicity. I prepared an animation of the seismicity during 2015, with epicenter diameters representing magnitude and color representing depth. Below is a static map of the embedded video below.